You know coffee is good for that morning jolt you need or as a way to wake you from your midday slump. But did you know that coffee may also have the powers of weight loss? Specifically, green coffee possesses some highly potent abilities to help people lose weight—so much so that it has been featured on the Dr. Oz show as an effective solution to the weight loss dilemma that leaves many people in a state of frustration. 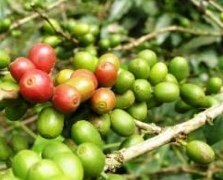 Green coffee comes from unroasted coffee beans. When coffee beans are roasted, the chlorogenic acid inside is broken down which is fine if you are not trying to lose weight. However, if you are trying to lose weight, breaking down this highly potent weight loss ingredient all but renders the coffee beans ineffective for weight loss. The chlorogenic acid helps reduce the body’s absorption of glucose and fat which results in a decrease in your insulin levels. Many studies have been done showing that overweight people who used green coffee lost weight without having to change the way they eat or the amount they exercise. Green coffee beans have no aroma and possess a bitter taste unlike regular roasted beans. 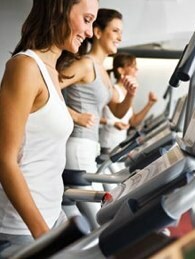 In a recent study, after 60 days of use participants experienced an average weight loss of 5kg (11lbs). Most green coffee products contain low levels of chlorogenic acid which means their effectiveness is highly exaggerated and overstated. The recommendation is that green coffee products, in order to help you lose weight, should have at least forty-five percent chlorogenic acid in it. 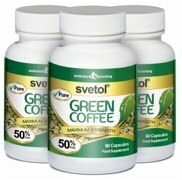 But Svetol upped the ante and boasts fifty percent chlorogenic acid in its product. Aside from the high level of chlorogenic acid, Svetol has less than two percent caffeine and is suitable for vegetarians and vegans. It is also gluten free, nut free and certified kosher. Taking one capsule of Svetol is comparable to taking three to six cups of coffee depending on the quality and preparation method of the coffee that you drink. Aside from the chlorogenic acid, the product also has caffeic acid which serves as an antioxidant. Caffeic acid is said to help the liver control lipid oxidation. What is also unique about Svetol is that it does not contain some harmful molecules, like cafestol and kahweol, which regular coffee usually has. Svetol is proud to say that it has a lot of research and studies to back up its claims including one study done on fifty people—half of which took Svetol and the other half a placebo. After sixty days, the Svetol group lost nearly six percent of their starting weight (an average of eleven pounds). Other studies done on the actual product itself showed that Svetol is able to reduce your blood sugar level after you eat, reduce your body mass index and breakdown fat reserves. It has also been well publicised by Dr Oz that you should only purchase green coffee products that contain Svetol green coffee beans as well as at least 45% Chlorogenic Acid! Taking Svetol is easy and does not interfere with your day. All you are required to do is take one capsule a half hour before breakfast and another capsule a half hour before lunch. Just make sure you take it with a large cup of water. One bottle of Svetol has sixty capsules which is a thirty-day supply. Svetol has a lot of science, research and studies to back up its claim as a weight loss product that really works. It is reasonably priced at thirty nine dollars a bottle. The company offers a thirty-day money-back guarantee and ships anywhere in the world. You also get a seven-day diet plan that you can download after you purchase Svetol. While there are many reviews on the company’s site from people who have bought the product and loved it, there are no before and after photographs. For some people, this may be a bit suspicious, but there are several reviews—all favourable—that might help and ease a person’s mind. Svetol’s reasonable price and scientific claims give little reason why anyone would not want to try it. Even the notable Dr. Oz has raved about green coffee and how it can help you lose weight. 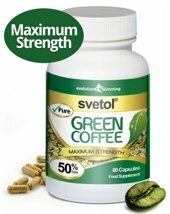 While you certainly should watch what you eat and engage in regular exercise, adding a green coffee supplement like Svetol may be a way to jump start your weight loss or get your body out of a weight loss plateau. You certainly have nothing to lose (except weight) by giving Svetol a try. Available to buy exclusively from Evolution Slimming. Evolution Slimming is based in the UK but ships to virtually every country. A one month supply is £24 / $39 and there are price price breaks for multiple months purchases.